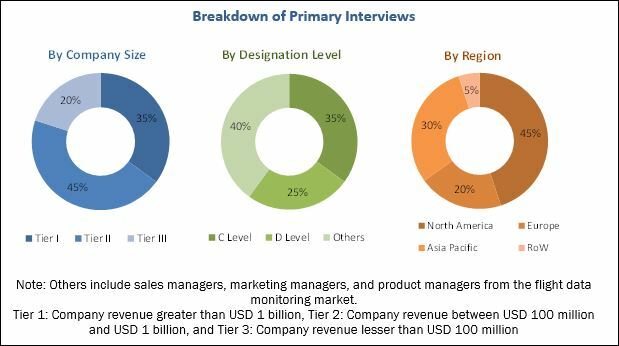 [143 Pages Report] The flight data monitoring market is estimated to grow from USD 3.45 Billion in 2016 to USD 5.34 Billion by 2022, at a CAGR of 7.55% from 2017 to 2022. Objectives of this study are to analyze the flight data monitoring market, along with its statistics from 2017 to 2022. It also aims to define, describe, and forecast the flight data monitoring market on the basis of end user, solution type, component, and region. The year 2016 has been considered as the base year for the study, whereas, the forecast period is from 2017 to 2022. This research study involved extensive use of secondary sources, directories, and databases, such as D&B Hoovers, Bloomberg Businessweek, and Factiva to identify and collect relevant information on the flight data monitoring market. Primary sources included industry experts from the concerned market as well as preferred suppliers, manufacturers, solution providers, technology developers, alliances, and organizations related to all the segments of the industry’s value chain. Both, top-down and bottom-up approaches were used to estimate and validate the size of the flight data monitoring market. The flight data monitoring market ecosystem comprises flight data software, system, and service providers, such as Curtiss Wright (US), Teledyne Controls LLC (US), Safran Electronics & Defense (US), Guardian Mobility (US), Flight Data Services Ltd. (US), and Scaled Analytics Inc. (US). 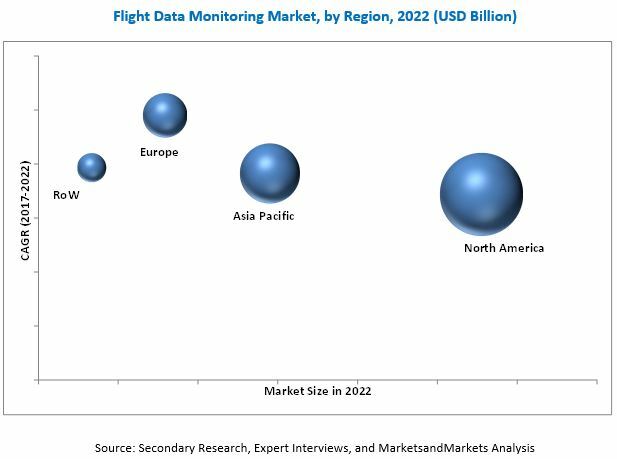 The flight data monitoring market is projected to grow from USD 3.71 Billion in 2017 to USD 5.34 Billion by 2022, at a CAGR of 7.55% from 2017 to 2022. The increasing demand for enhanced situational awareness for efficient airline operations, need to reduce the cost of unscheduled maintenance, increasing volume of data generated by the aviation industry, and rise in aircraft deliveries are factors that are expected to drive the flight data monitoring market. Based on component, the FDM service segment is estimated to lead the flight data monitoring market in 2017. Factors such as increasing aircraft deliveries and the demand for the improved operational efficiency of airlines are fueling the growth of the FDM service segment. Based on solution type, the on ground segment is expected to lead the flight data monitoring market during the forecast period. The increasing use of the ground-based flight data monitoring analysis software is driving the on ground segment. Based on end user, the fleet operators segment is estimated to account for a major share of the flight data monitoring market in 2017. The increasing fleet size of major airlines in the APAC region is driving the flight data monitoring market. Major system manufacturers, software developers, and service providers in the flight data monitoring market are located in the US, the UK, and France. Europe and the Asia Pacific are the prime markets for service providers. This market study further analyses market drivers, restraints, opportunities, and challenges to access the impact of these factors on the market. Key players operating in this market include Curtiss Wright Corporation (US), FLYHT Aerospace Solutions Ltd. (Canada), Safran Electronics & Defense (France), and Skytrac Systems Ltd. (Canada). North America is estimated to account for the largest share of the flight data monitoring market in 2017. This share of North America can be attributed to the large aircraft fleet size as well as the presence of component manufacturers and service providers in the US. However, the market in the Asia Pacific is projected to grow at the highest CAGR of 9.80% during the forecast period due to the growing demand for aircraft and flight data monitoring services from Asia Pacific countries in recent years. Significant investments are required at different stages of the value chain of the flight data monitoring market (especially in the R&D, manufacturing, system integration, and assembly stages). Products offered by various companies operating in the flight data monitoring market have been listed in the report. The recent developments section of the report provides information on the strategies adopted by various companies to strengthen their positions in the flight data monitoring market. Key players operating in this market include Curtiss Wright Corporation (US), FLYHT Aerospace Solutions Ltd. (Canada), Safran Electronics & Defense (France), and Skytrac Systems Ltd. (Canada).